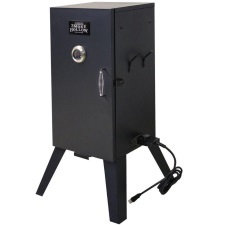 The 26” Smoke Hollow with adjustable temperature control is a smaller smoker for large smoking projects. It has two 14” X 12” chrome-coated cooking trays that are fully adjustable, so within the 26” high, 1.3 cubic foot smoking area, you can smoke a whole turkey and a large ham shoulder. This product would not be recommended for anyone that smokes big batches of jerky because they would have to buy more smoking grids or trays to spread out the jerky, but that is an option if you are pleased with this smoker. However, this is more for those big cuts of meat, poultry, or fish and you can easily smoke a holiday ham or shoulder and a turkey at the same time. When you are spending less than $100 for a smoker, you really must consider what you will primarily be using it for, if you will be smoking mostly large cuts of meat, this is the smoker for you. Interested in a larger smoker, same brand but with a viewing window? Check out the Smoke Hollow 36-inch 3616DEW Electric Smoker which has a nice clear viewing window for checking up on the goodies. It does cost a few dollars more, but it just might be the one you need. The adjustable temperature controls the internal temperature without constant watching, taking the guesswork out of the smoking process. This little smoker with a 1500-watt heating element has a 150° F variance between 175° F and 325° F so you have near total control over your smoking recipes. Some prefer the slow-cooked goodness, while others like the high-temperature seared-in flavor for their smoked cuts. Large, thick cuts of beef and pork taste better when smoked slower, while fish and fowl do better smoked quickly. Anyone that’s ever had to do any kind of clean up after smoking meats, fish, and poultry knows that porcelain coated pans are easier to clean up and do not add chemicals to the smoking process. Porcelain-coated water/juice pans and chip trays allow you to add naturally good flavors, such as apple juice or maple syrup to the water pan or chip tray without having to scrape those out with a wire brush later. Just like the porcelain-coated cookware you see on TV, these are non-stick; therefore, easy to clean up and store for the next use. No one wants to spend more time cleaning up than they did smoking. The Smoke Hollow with adjustable temperature control is a marvelous product for the price. Are there drawbacks, sure, but you should remember you are buying a small smoker for less than $100, so temper your expectations to the size of the grill. You wouldn’t buy a toaster oven to cook a 25-pound turkey, so why would you expect more from a 26” smoker? We found 219 verified Amazon customers with an average rating of 3.6 stars out a possible 5 stars. 73 percent of those verified Amazon buyers rated it either 4 or 5 stars. There were a few complaints about the heating element shorting out; but overall, they seemed happy with the customer service replacement policy and those who used the 12/3 AWG extension cord got better results. In summary, this smoker is a sturdily-built small smoker with a reasonable price. I would say that for its size it is very well built and for the price, it should give most backyard smoker enthusiast many seasons of smoked goodness for even large cuts of meat. I’m sure you’ll soon be experimenting with different juice and wood flavorings.